This weekend's challenge is fairly simple. You will need a flexible tape measure and a calculator. If you don't have a flexible tape measure, use a piece of string or a belt for the measurements. Then use your ruler to measure the string. Nowadays, most people discourage the body mass index (BMI) as a way to accurately assess your health. BMI doesn't take into account your body shape (short or tall, apple or pear) or the amount of muscle you have versus fat. However, I feel if your height and weight are the only information you have, it can clue you in a little bit to your general health. You know there is muscle on your body if you lift weights 3x/week. If you are typically more sedentary, knowing your BMI might help motivate you to take action and head outside for a walk. National Health Service (NHS) They even have a phone app. But this challenge is about your waist and hips! 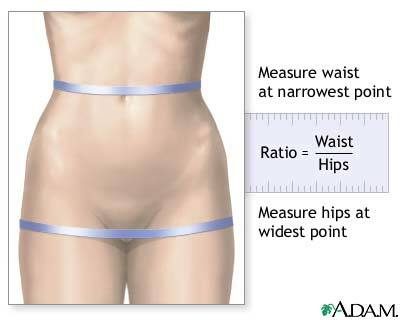 Recently, the waist-to-hip ratio is coming more into fashion for assessing your general health. It indicates how much visceral fat (around your internal organs) you have. Apple-shaped bodies increase the risk for complications with obesity such as high blood pressure, coronary heart disease, and type II diabetes. The apple shape can be due to genetics but it is a good idea to keep your overall weight in check, no matter what shape your body naturally is. 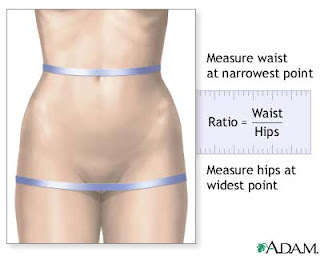 Use this tool on the BBC's website to calculate your waist-to-hip ratio. Go ahead and have a measure. I have an 80cm waist this afternoon and a 100cm hip making my ratio 0.8 or average. How did you do? 1. Can you run for the bus? 2. Can you climb the stairs? 3. Can you easily tie your shoes? I received one for Christmas (for assessing clients) and we had a lot of fun seeing who gained body fat due to all the holiday feasting. Athletes have different standards as they are paid to train and compete. Lucky ducks! Click here for an interesting article on how women bodies have changed shape over the last 50+ years. Which do you prefer? Why do you think we are changing? Is is for better or worse?